At Kilcarnup there was an Osprey nest that had been built up over many years. Each year I visited Kilcarnup and could photograph the proud parents with their chicks. You can see images of the Ospreys in earlier posts. After the Margaret River bushfires, the nest was abandoned and I was disappointed that I couldn’t see these magnificent birds at Kilcarnup. I visited the nest a few weeks ago, and it was in a state of disrepair. The day I visited the weather was dreadful and I didn’t bother to look around. However I was told that the Osprey’s were building a new nest, so today I went to see. There were 3 Osprey in the area that I could see. The new nest has a long way to go before it reaches the size of the old one, but it is a good start. The new nest is about 500m from the old ones on Cape Mentelle. 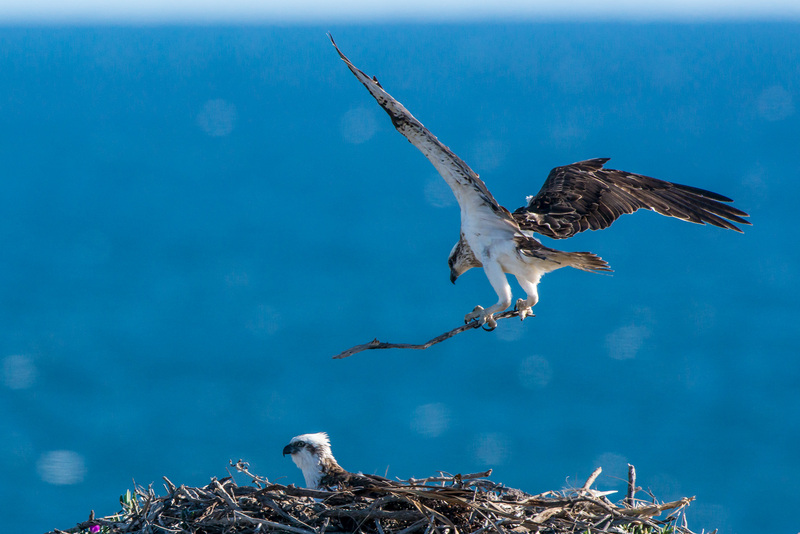 Ospreys rebuilding a nest abandoned after the Margaret River bushfires. This entry was posted on September 16, 2015 by ianwiese. It was filed under Australia Day, Birds and was tagged with Osprey.